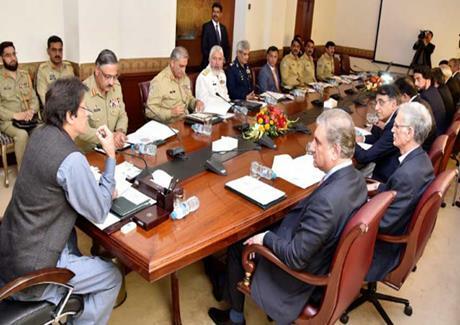 Prime Minister Imran Khan chaired a meeting of National Security Committee (NSC) in Islamabad on Tuesday. The meeting reviewed security situation of the country. The Prime Minister also apprised the participants about his recent visit to China. The meeting concluded that progress and prosperity of Pakistan lies in peace, stability and rule of law. The meeting was attended by Foreign Minister Shah Mehmood Qureshi, Defence Minister Pervez Khattak, Finance Minister Asad Umar, Information Minister Fawad Hussain, Minister of State for Interior Shehryar Khan Afridi, Chairman Joint Chiefs of Staff Committee General Zubair Mahmood Hayat, Chief of Army Staff General Qamar Javed Bajwa, and senior officials. Meanwhile, talking to Minister for Religious Affairs in Islamabad on Tuesday, Prime Minister said the government wants to present an image of peaceful Islam before the world. Imran Khan said it is responsibility of the state to present true teachings of Holy Prophet Hazrat Muhammad (peace be upon him) to our next generation. The Prime Minister said 12th Rabiul Awwal will be celebrated with religious fervor and enthusiasm in the country and directions have been issued to all provinces in this regard. He said a two-day Khatim-e-Nabuwwat International Conference is scheduled to be held in Islamabad in which Imam-e-Kaaba, Vice Chancellor Jamia Azhar, Mufti of Syria, and Ulema from Iraq and Tunisia will shed light on different aspects of the Life of Holy Prophet (PBUH). Prime Minister said research works regarding Seerat-e-Tayyaba will promoted under the supervision of the government. The Minister of Religious Affairs briefed the Prime Minister about prevailing situation of the country.